Bob Cannard has been farming sustainably for 30 years, providing produce to Alice Waters’ Chez Panisse restaurant in Berkeley. Growing up in the commercial nursery business, he has since developed the natural process approach to agriculture that's used at Green String. He has long been an important member and teacher of the sustainable food and beyond organic movement in Northern California. Fred Cline acquired a love for agriculture and vinifying grapes into wine on summer visits to his grandparents farm when he was young. 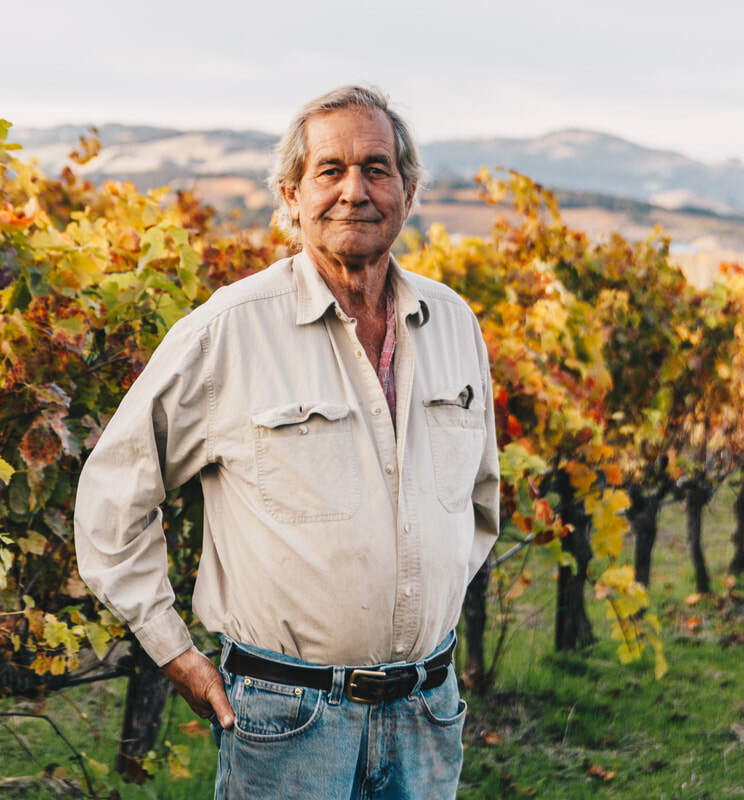 He founded Cline Cellars in 1982, and has been growing his grapes the Green String way, without any synthetic fertilizers or herbicides since 2000. By embracing the beyond organic movement he has been able to produce award-winning wines while caring for the environment. We grow cover crops next to or in rotation with food crops to introduce nitrogen to the soil and create a root system to hold the soil together. Cover crops like clover, vetch, and fava beans are essential for strengthening soil fertility in natural process farming. Cover crops also help manage soil erosion, improve soil biodiversity, and help control pests and diseases. We introduce beneficial microbes (like bacteria, fungi, nematodes, and protozoa) into the soil by applying compost tea, a handful of dry compost with nutrients soaked in water overnight. Finely crushed volcanic rock and powdered oyster shell provide easily accessible minerals and calcium for soil microbes to break down and transfer to our plants. This creates soil which helps plants build their own immune systems, and foregoes the need for chemical pesticides. Instead of fighting against weeds, we let them grow up alongside our food crops. When they threaten resources like light and space, we hoe or mow them back just enough, and leave the cut plant material to enrich the soils. Sometimes, we get a little help from herds of goats and sheep to keep overzealous cover crops in check! By resisting the urge to allow only the food crop to grow, we maintain biodiversity and enrich the soils while spending less time eradicating “undesirable” plants from our fields. 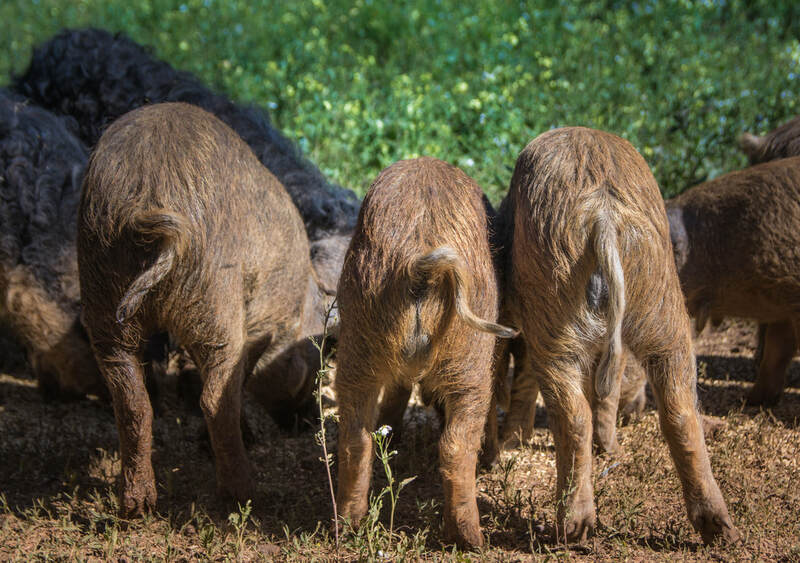 Our Red Wattle’s live side-by-side to our Mangalitsa pigs, foraging and roaming free on thousands of acres. Unlike much of the pork that you buy at the grocery store, where the pigs are raised never touching anything but cement, our pigs can be found playing in their hollows (mud holes) and lounging around the various pastures where they forage. Red Wattle is a domestic breed of pig from the United States. It is best known for its red color and two wattles hanging down on either side of its neck. The Red Wattle meat is lean and tender and has excellent flavor. We supplement their natural foraged diet with Pearled Barley, Rolled Wheat, and Extruded Flax. The old world breed animal from Hungary has gained popularity in recent years for its wooly coat and being named the “Kobe Beef of Pork”. The flavor of Mangalitsa pork is unbeatable among many other breeds. It is known for it’s highly marbleized fat and rich flavor. 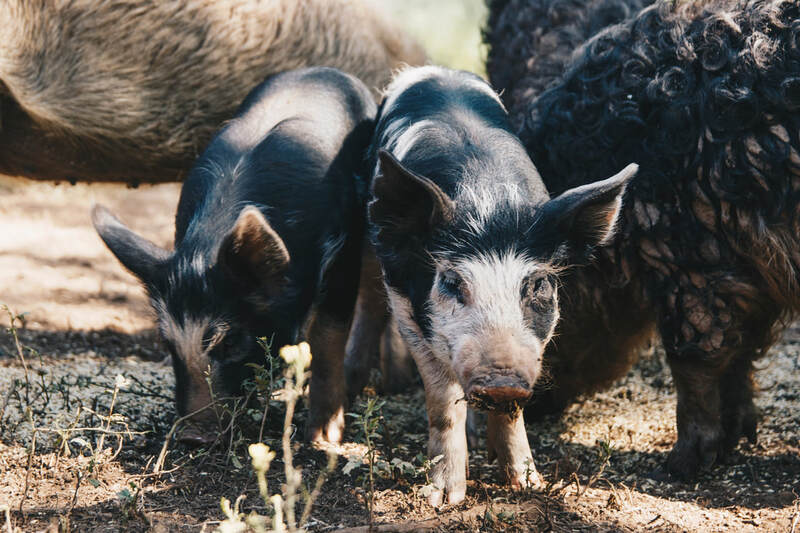 Our Mangalitsa pigs live a carefree life at the Meadowbrook Ranch in Tehama County! With plenty of vegetation, our animals are raised and graze freely on thousands of acres of virtually untouched land. We supplement their natural foraged diet with Pearled Barley, Rolled Wheat, and Extruded Flax. Our cattle at Meadowbrook Ranch live a pretty glamorous life! Spending their summers in beautiful Lassen County and winters at the Meadowbrook Ranch in Tehama County. With views of Mt. Lassen and Mt. 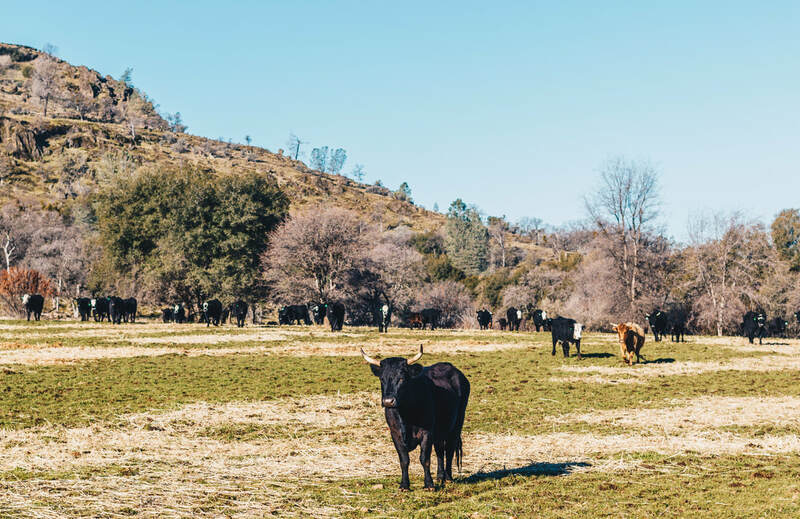 Shasta, our cattle have thousands of acres to roam, graze and reproduce naturally. ■ Fed or injected with any antibiotics or ingredients containing possible antibiotic residues, including most boluses. ■ Implanted with any synthetic hormones, growth promotants or steroids of any kind. 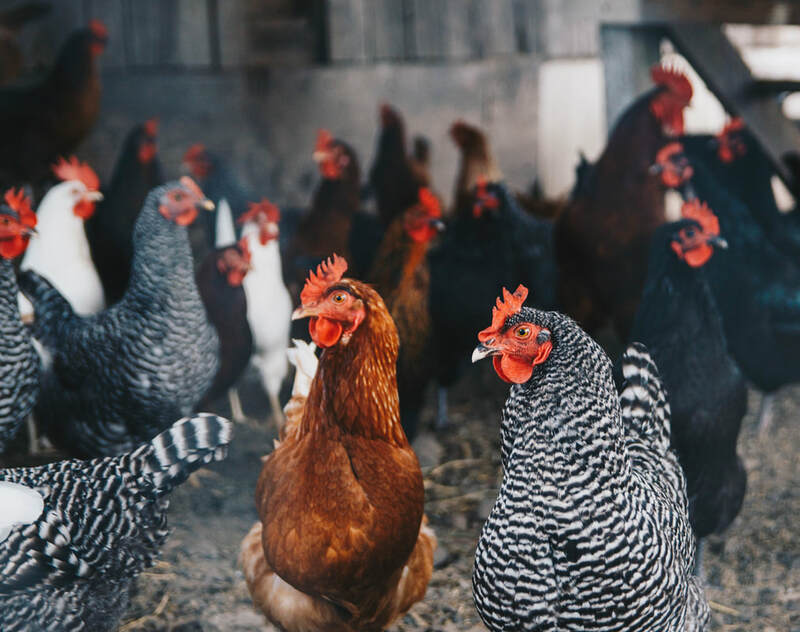 The chickens at Green String Farm are a happy bunch! Raised on Green String vegetables with a supplement of organic chicken feed, these lovely ladies eat better than most. This means that the eggs you get from our Green String Farm chickens are organic, cage free, free range eggs! Come out to the farm and visit the happy chickens and see exactly where your eggs are coming from.